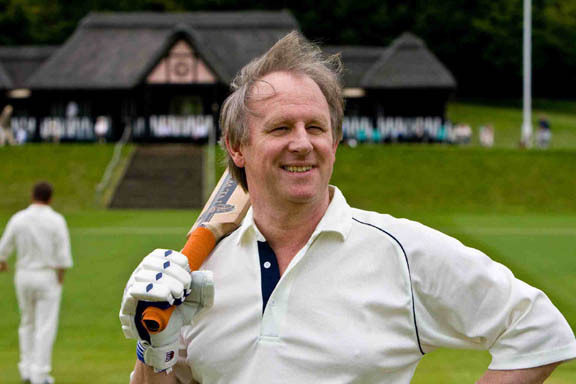 Barnaby gets cajoled into umpiring a cricket match between the villagers and toffs of Midsomer Parva. Fellow umpire Malcolm Frazer is an eccentric, retired spymaster who lives with his son Nicky and daughter-in-law Jenny - also former Cold War operatives - at Allenby House. Barnaby tells an incredulous Joyce that he was recruited by MI6 when he left police college. Brenda Packard, a spy and WI member, reveals that Allenby House is to be used as a safe house. Glen Jarvis is in charge and tells Barnaby rudely he needs no help. Causton Museum is broken into and Jones flirts with curator Amanda Watson. Newly promoted DC Gail Stephens interviews Seth Comfort who thinks his sheep are being viciously killed by 'the beast of Midsomer'. Geoffrey Larkin, a spy turned defence consultant and one-time county cricketer, comes to Allenby, and Nicky Frazer recruits him to the cricket team. Larkin made his money after the Berlin Wall came down and offers to sell Frazer a file marked 'Wolfman'. Later that night, Jenny slips out to meet a lover in the stables. At the cricket match, Barnaby accuses Nicky Frazer of ball tampering but the Allenby team win, resulting in a major punch up. Then Geoffrey Larkin is gashed to death. Jarvis blames Barnaby, Seth blames the beast and even Dr Bullard admits the injuries appear to have been inflicted by a giant claw. Then Brenda tells a livid Barnaby to back off because he has no jurisdiction at Allenby House. Even car dealer Jimmy Wells won't talk to him because he signed the Official Secrets Act. In a fit of pique, Barnaby resigns. Nicky and Jenny argue but when she goes looking for him, he is dead in the cow shed, his face and throat lacerated. Barnaby returns to work - he suspects the killings are linked to the spies' time in Berlin, but gets few answers from Malcolm. Finally, Brenda admits they were betrayed by one of their own during an operation to get people over the wall. Amanda discovers an old animal skull is missing from the museum. Jones finds it in Seth's shearing shed - it's a sabre-toothed cat. But Seth denies using the skull to kill. What is the link between the unidentified Cold War traitor and the murders? Barnaby and Jones realise events at Allenby hold the key but when they get there Malcolm and Jenny have disappeared. Can they find them and get to the truth in time?